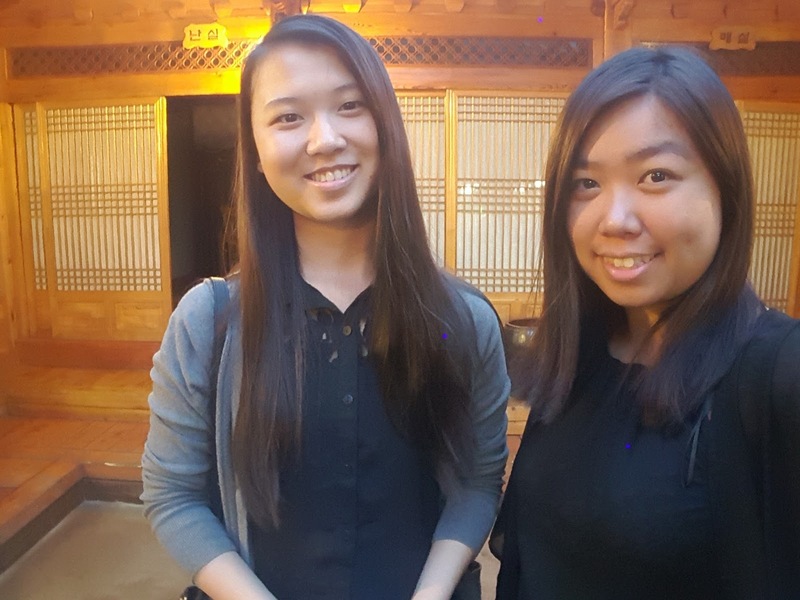 We wanted to get the traditional Korean food experience, with many side dishes and more authentic flavors. The restaurant we stopped by was called Sanneri (산내리). The path to get here was confusing, once again because Google Maps failed to show us where all the hidden alley ways were. It was a constant trial-and-error to figure out where we could turn, and where we couldn't turn. Once we were inside, we were given a menu with varying set courses, and a smaller section int he back if you preferred to order only one main dish. The set we bought cost 44,000 won per person. We started off with pumpkin soup. The soup was not overly thick like Western soups, but rather thinner and had a more mild flavor. It was sweet, but the natural pumpkin flavor was still there. 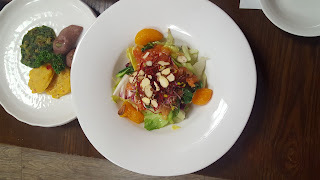 The fruit and lettuce salad was light and refreshing, much better than I expected it to be. The clementines were sweet and balanced out the citrusy salad dressing. The sliced almonds added a rich nuttiness and great texture. There were three types of pancakes. There is vinegar soy sauce mixture on the side for dipping sauce. Two were savory--a corn fritter and the other was a chives pancake. The purple one was filled with red bean paste. 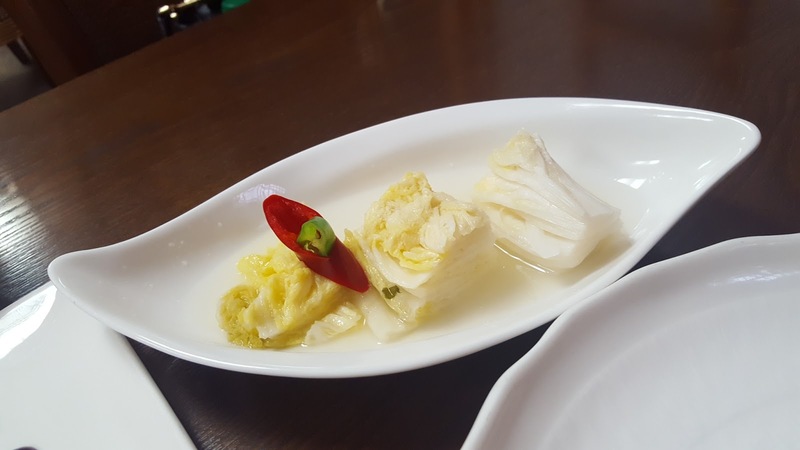 White kimchi and a mung bean jelly salad was served along with the first round of appetizers. The mung bean jelly was pretty good. I expected it to taste really bland, but it was similar to eating noodles, except it broke off easier--it was topped with sesame seeds, and egg and pepper garnishes. The first star of the course was a beautiful plate or raw seafood. I'm not sure what the white fish was, but the fish on the right was obviously salmon. 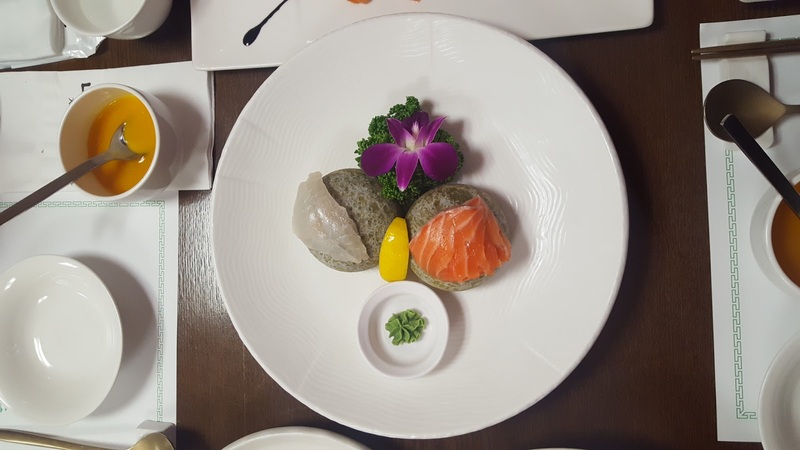 There were 3 slices of each fish sitting on a rounded stone. The pop of color from the flower, greens, and lemon really highlighted the dish. The white fish was tougher than it looked and had more of a bite to it. The salmon was heavenly. It was tender and melted in your mouth. I chose to dip my fish in the Korean vinegary chili paste dipping sauce since I'm not a fan of wasabi. The sauce helped balance out the strong taste of the white fish, but the salmon didn't need it at all because it tasted so fresh. Round 1 of the course meal was finally over. We were served a light and savory chive soup. There were bits of traditional Korean flower buds gathered at the bottom of the soup. 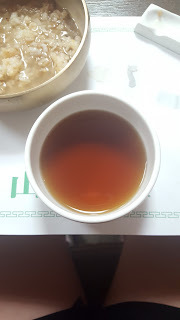 I suspect an anchovy base, because there was a hint of seafood flavor in the broth along with a subtle spiciness. It was a nice palate cleanser for the next round. The soup would be a perfect compliment to toss in a boiled bundle of noodles. The 2nd round of food came with heavier dishes. One of them being this seasoned raw beef (beef tartar/육회 yukhoe). 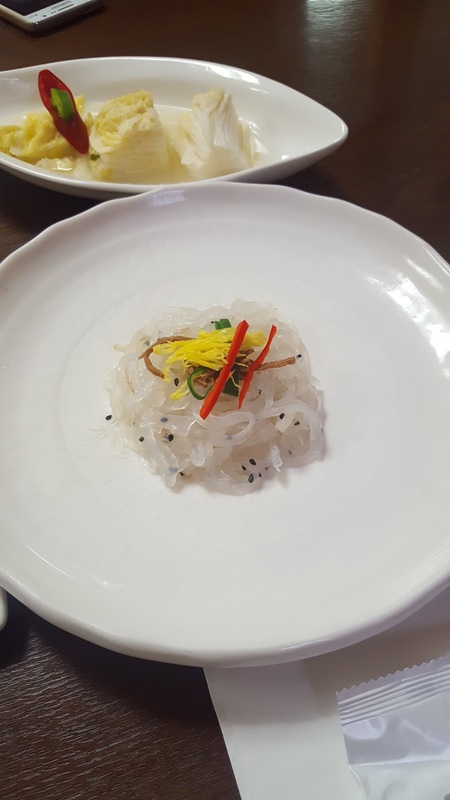 Usually, I see this served with a raw egg yolk on top, but this one was served with julienned Korean pear, a sliver of jujube and sprinkled with sesame seeds. Raw beef takes a while to get used to, but once you overcome the texture, the taste itself is pretty good. The sesame oil in the marinade perfumes the beef as you chew. Another dish was this sweet and spicy fried eel is similar to sweet and sour pork, but it has a stronger spicy kick. The eel was still surprisingly crunchy despite the heavy coating of the sauce. The dish also had chunks of bell peppers. This 8 treasures dish was definitely another scene stealer with its vibrant colors and plating. 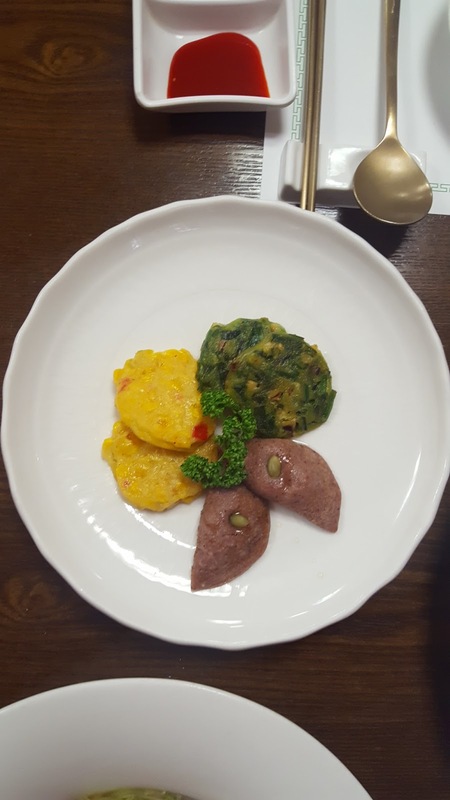 The vegetables individually were barely seasoned, and the thin crepe in the center wasn't seasoned either. The key is the mustard/soy sauce dipping sauce on the side that elevates the flavors of each ingredient, creating the perfect bite wrapped up in the thin crepe. 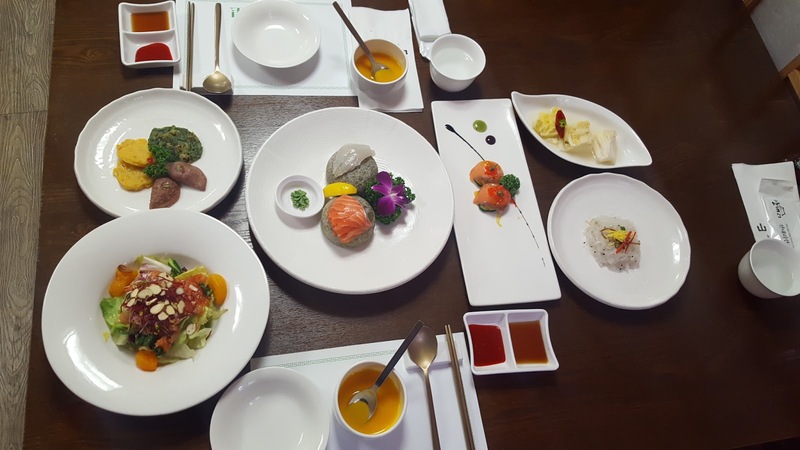 The "treasures" included shiitake mushrooms, white egg, yellow egg yolk, burdock, cucumbers, carrots, potato, and fish cake. Finally, the one dish that jolted me out of my entranced state of amazement and constant moans of pure bliss. Once again, the plating was beautiful, but for me, this dish just didn't make sense. It was composed of assorted dried fruit chips stacked on broccoli and coated in a sweet fruity glaze. The broccoli didn't really go well with the sauce, nor did the dried fruit. The texture of the dried fruit that was partially rehydrated didn't work for me. This on the other hand, is one of the more common dishes outside of a luxury traditional food setting. It was a spicy stir friend squid with vegetables such as onion, and broccoli. The squid was perfectly cooked, not rubbery at all. And it definitely didn't have the strong seafood odor that could be a bit too overpowering sometimes. The squid was sweet at first, but then the spice kicks in as you chew for a bit. I enjoyed the dish. Another classic--braised short ribs. The perfectly succulent chunk of meat that soaked in all of the yummy rich seasoned soy sauce. The sauce was amazing--you could tell immediately that it was simmered for a long time because the sweetness from onions, fruit, garlic, etc, were all completely infused into the soy sauce. I could throw in a few spoonfuls of rice and eat it with the sauce alone, and that would be more than enough. In Korean, it would be literally called a "rice-stealer." This soy sauce marinated raw shrimp is another dish where the sauce itself is just so incredibly delicious. The taste of seafood lingers in the soy sauce. But personally, I'm not a fan of raw shrimp because it does get a bit too slimy for me since the flesh is thicker. I prefer the soy sauce marinated raw crab instead. After all of the small, yet really filling dishes, both of us were getting really full, yet the waitress continued to bring out more food, such as this well fermented soybean paste stew and the scorched rice soup. The soybean paste soup was really strong, but really tasty. I'm not a fan of scorched rice drinks, but I tried to drain most of the liquid from the rice and dumped it into the stew instead. That was perfect because the rice itself was bland, so it balanced out the concentrated stew. On it's own, the stew is a hearty comfort meal that warms you up. 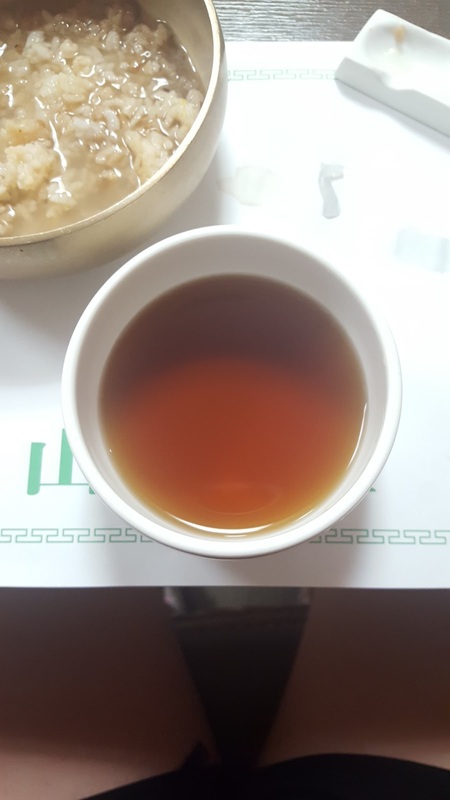 Lastly, we ended our long meal with some watermelon and plum tea. Both of us left, feeling really full, but completely satisfied with our traditional Korean meal.